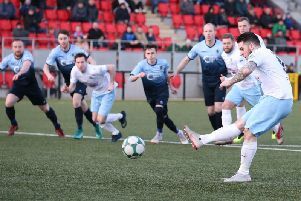 Michael McCrudden says he won't be returning to Institute FC. The club’s former assistant boss has been asked to take charge for tomorrow’s Irish League clash with Ballymena United at the Ryan McBride Brandywell Stadium and insists he will focus only on the players available to him. 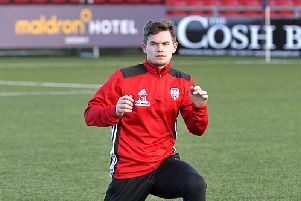 While ‘Stute’s skipper and top goalscorer, McCrudden claimed he won’t be returning to the club after signing an 18 month pre-contract with Derry City which comes into effect next summer, Doherty admits the situation is out of his control. Doherty, who is a Grassroots Development Officer for the IFA in the north west area, was contacted by the Institute Board of Directors and asked to take charge on an interim basis last Sunday when Paddy McLaughlin announced his resignation. “I’ve been asked to take the team for Saturday to give the Board a bit of time to get themselves right,” he explained. Doherty said he has no doubt the players can bounce back from this most recent set-back and tomorrow’s match is the perfect release after a chaotic few days off the field. “I was at the club for three years and we had a couple of disappointments in the play-offs so I know the mentality of the players and how they can bounce back from the difficulties that we’ve had with grounds and different incidents over the years. They need someone to guide them and I’m here to help. “I’m just trying to get down to who’s fit and ready and we’ll come up with some kind of plan. We’ll not lie done, we’ll try do something. Should he start his temporary rein with victory, could he be enticed to stay the duration of the campaign? “I’m interim manager for Saturday. Let’s get that out of the way first. I’m IFA Development Officer for the North West, that’s my bread and butter and there’s extensive work in that role as well so I have to make sure that’s covered. It won’t be hindering that at all. “But I’ve been asked to give the club a little bit of time to sort out where they’re going and I’m happy to oblige.